Exxon's magic number: Was the spill bigger than we thought? When the Exxon Valdez struck Bligh Reef in Prince William Sound in 1989, it created one of the largest-ever oil spills in the United States. The exact size of the spill, at least at first, proved contentious, but as the years passed, an early report became part of history: 11 million gallons. Early on, both an experienced salvage boat skipper on the scene soon after the spill and an independent marine surveyor hired by state attorneys claimed the spill must have been at least twice as big as the figure reported by Exxon. In 2001, scientists studying the amount of oil lingering in the Sound found many times the amount they expected. With the spill's 15-year anniversary arriving Wednesday, March 24, state regulators and attorneys still can't be certain the spill was only 11 million gallons. The amount of oil spilled never necessarily mattered to the state and federal governments' effort to collect money for damages to Alaska's economy and environment. The number of animals killed and the miles of shoreline affected provided the more important figures. Initial reports of the spill's size rarely came into question. “It wasn't necessary to know that number to arrive at an appropriate settlement,” said Craig Tillery, who served as lead attorney for the state when Alaska's settlement with Exxon was approved. Tillery is now a chief assistant attorney general for the state. He said he has no reason to believe 11 million gallons wasn't the right number. But the state also never proved that figure. Alaska stopped its own investigation into the size of the spill after completing the settlement. Today ExxonMobil says suggestions the spill was larger than reported are conspiracy theories, the work of “poets turned engineers.” The company stands by its numbers. “The calculation was done under the direct supervision of the U.S. Coast Guard. This conspiracy theory on how much was spilled is garbage, and that's all we have to say about it,” said Tom Cirigliano, an ExxonMobil spokesman. In the summer of 2001, the Exxon Valdez Oil Spill Trustee Council - formed to oversee the restoration of the ecosystem damaged by the spill - funded a half-million-dollar project to gauge, among other things, how much oil was left in the spill area. National Marine Fisheries Service research chemist Jeff Short served as one of about a dozen people working on the project. “We found about 10 times as much (oil) as we thought we'd run into on a volume basis,” he said. Short, who works at a National Oceanic and Atmospheric Administration lab in Auke Bay, calls the 11-million gallon estimate of the spill a “minimum” amount. The size of the spill echoed as 11 million gallons for so long it's now taken for granted as the correct amount. But in the first months and years after the accident, it presented industry watchdogs and environmental groups with an appealing mathematical puzzle as they worked to prove Exxon wrong. More information has since become public, but trying to piece that puzzle together is difficult now, as it was then. Some of the pieces are missing. A master pilot and salvage boat skipper identified in public records of the spill as Capt. Nikk Hennessy arrived at the site of the accident about 12 hours after the Valdez ran aground. He became one the most-cited critics of the 11-million gallon figure. 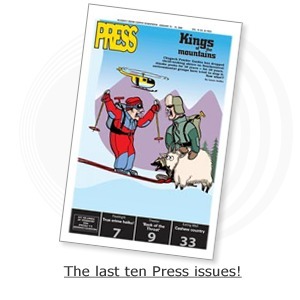 A few publications, such as the Village Voice and the Homer News, began to retell his story - that smaller vessels which came to take the remaining oil off the wounded Exxon Valdez couldn't have carried away as much oil as Exxon claimed. Hennessy said at the time, one of these “lightering vessels,” the Exxon San Francisco, wasn't in the area long enough to pump as much oil off the Valdez as reported. He claimed other lightering vessels didn't appear to be carrying the kind of heavy loads they reported. Hennessy could not be located for comment for this story. U.S. Coast Guard officials concede initial reports about the size of an oil spill often prove too conservative, but are sorted out quickly. But Exxon critics like Yukon Island resident Findlay Abbott, one of thousands of plaintiffs in an ongoing case against the company, say some reports that could prove the size of the spill never became public. The Exxon Valdez was carrying about 53 million gallons of oil when it ran aground. Three lightering vessels came to the rescue, unloading all the oil that didn't spill. It should be easy to see how much was spilled by subtracting the amount of oil carried away from the original load. But critics like Abbott and a Washington, D.C.-based animal protection group, Defenders of Wildlife, said much of the fluid those smaller tankers hauled away was water mistaken for or reported as oil. The only numbers available to determine the spill's size came from a company called Caleb Brett, which gauged the tanker loads. Hired in this case by the state Department of Environmental Conservation, Caleb Brett also counted Exxon among its clients. Caleb Brett records can be found showing two of the lightering vessels - the San Francisco and the Exxon Baton Rouge - carrying plenty of oil away from Prince William Sound, then heading to ports in Hawaii and California. When they came back after about two weeks away, reports show they carried lots of water and little oil. What's missing is documentation of how much oil and how much water those vessels actually offloaded between stops in Valdez. One of the state's claims against Exxon came under an Alaska statute that penalized companies a dollar amount for each gallon spilled. Lawyers working for the state in 1991 hired a Texas business that provided independent marine surveys to look into the amount spilled. Principle surveyor James Murchison reported that from the information available at the time, the Valdez appeared to spill much more than the 11 million gallons reported. Oil gushing from the tanker immediately after the accident, he wrote, and seawater forcing itself into the Valdez because of hydraulic pressure, would create a tremendous churning force resulting in emulsification of the oil and water. “It is always difficult, even in ideal situations to differentiate between emulsified oil and water, and oil, and in this case very large quantities of water was apparently measured as oil,” he wrote. 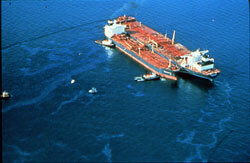 Murchison estimated the Exxon Valdez spilled a minimum of 25 million gallons. But when the state was making its case against Exxon in the early '90s, it was trying to determine the size of the spill on its own by figuring out how much oil the lightering vessels carried away. The state stopped working on the project after reaching a settlement with Exxon in 1991. Except as a benchmark against other spills, the number didn't matter any more. The state and federal government shared $900 million from the settlement, which Exxon paid over a 10-year period. Maybe Alaska could have gotten more money out of Exxon, Tillery said, but the state's attorneys had to weigh the benefit of hashing the case out in court for years versus getting cash immediately to spend on restoration and cleanup work. Today, other plaintiffs - more than 30,000 fishermen, Alaska Natives, business owners and communities that sued Exxon in a separate case - wait for their claims against the company to finally make their way through the court system and into their pockets. After years of hearings and appeals, the plaintiffs want closure. Questions of whether the size of the spill went under-reported are largely ignored or forgotten. Earlier this month, the Prince William Sound Regional Citizens' Advisory Council held its annual meeting, which served as an anniversary of the Exxon Valdez spill. Visitors passed around a jar of oil-soaked rocks and reflected on the accident and its aftermath. One attendee, Walt Parker, headed a group called the Alaska Oil Spill Commission, which then Gov. Steve Cowper formed in 1990 to figure out what caused the spill and why the clean-up response didn't go more smoothly. Like many Alaskans involved in the state's recovery from the spill and prevention against any similar, future disasters, Parker never had much incentive to prove or disprove the original reports of an 11-million gallon spill, he said.